The US Air Force has not adequately justified the purchase of 46 additional armed Reaper drones, according to the Pentagon’s inspector general. The expanded fleet could equal a waste of $8.8 billion, the watchdog said. “We determined the Air Force's Air Combat Command MQ-9 Requirements Branch did not demonstrate the need for the MQ-9 planned procurement quantities,” the Pentagon inspector general said in a declassified September report obtained by The Guardian through a Freedom of Information Act request. The Air Force has built up an armed MQ-9 Reaper fleet that numbers 401 – up from 60 in 2007. In that time, the cost of purchasing drones has hit more than $11.4 billion, according to the Pentagon’s report, meaning several tens of billions of dollars more in maintenance and operational costs. In 2011, former Department of Defense secretary, Leon Panetta called on the Air Force to amass enough drone aircraft for 65 combat air patrols by April 2015. The patrols require as many as four aircraft at a time to surveil targets. The watchdog said the Air Force ultimately could not justify purchases of 13 mission-ready drones at $2.5 billion; 11 training drones at $2.1 billion; five test drones at $958 million; four air national guard drones at $766 million; and nine attrition-reserve drones at $1.7 billion. 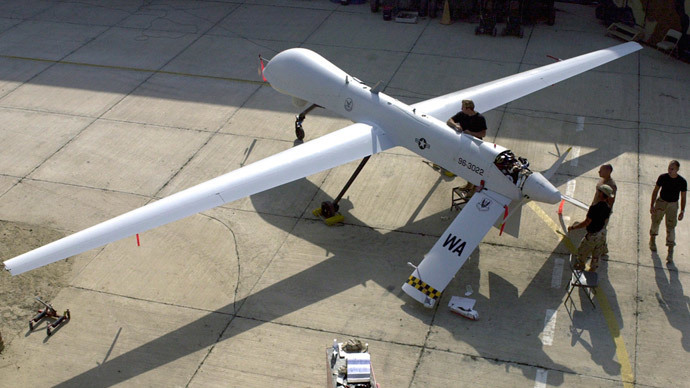 The 46 Reaper-drone purchases in question come to approximately $192 million apiece. The air combat command director of plans, meanwhile, said the inspector general overestimated the potential waste figures, saying the costs of the Reapers in question is more like $593.4 million and not $8.8 billion. “We are concerned that your report does not highlight these dynamic characteristics of an MQ-9 program that evolved during a period of significant conflict to meet warfighter needs at OSD [Office of the Secretary of Defense] direction,” said Major General Scott J Zobrist in an August reply to the inspector general. The office of the inspector general responded, saying its estimate was based on Air Force acquisition data for the Reaper drones, which are made by war contractor General Atomics. Zobrist then said his staff would consider the inspector general’s report “in our on-going MQ-9 cost and capability ISR [intelligence, surveillance and reconnaissance] gap study” ahead of its due date in March 2015. Armed Reaper and Predator drones have become the crown jewels of US counterterrorism weaponry, used from battlefields in Afghanistan and Iraq, to countries such as Pakistan, in operations that seek to eradicate alleged jihadist militants. While the Pentagon has no shortage of combat drones at its disposal, an internal service memo surfaced this month to reveal that the Air Force air combat command cannot keep up with educating and training new personnel to satisfy the Pentagon’s increasing demand for drone flights. The Pentagon is in the midst of cutting about $1 trillion in projected spending from its budget over a decade as required by a spending reduction law passed in 2011. "To be strong, we've got to stop the slide in defense budgets that has reduced our base defense spending 21 percent since 2010," Rep. Mac Thornberry said, according to Reuters, while adding that nobody "has a magic formula to do that."